This is a wonderful guest (re)post written by Guider Tara, originally posted to her blog The Daisy Field. Tara shares her thoughts about the importance of growing Guiding and sharing the inclusive ideals of Guiding in places both near and far! Growing Guiding at Vancouver Pride. Photo courtesy The Daisy Field. 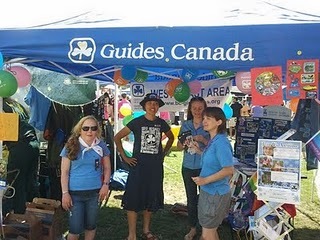 It was a big day for us…when the West Coast Area Girl Guides hosted a booth at the Vancouver Pride Festival. The response we received was overwhelming! People were so happy we were there and we heard over and over that it was long overdue. Many people were surprised to see us and to hear that we are an inclusive organization. I was moved by many stories of LGBT (lesbian, gay, bisexual, and transgender) people who had taken part in Guides and Scouts as children, and who felt it made a huge difference in their lives. I was deeply saddened by one woman that we talked to who long ago had been kicked out of Guides for being lesbian. One of my favourite moments was when three young women walked by, slowing down, and one girl turned to the other and said “Wow…Girl Guides love gays!” I just wanted to give her a huge hug! I also met a sweet young man who had grown up in Guides and credits it as being one of the saving graces in his younger years. We had a great talk about his involvement and he even bought a bunch of cookies! He challenged us to know more about the process for young people who are transitioning and curious. Many people were sad to hear that Scouts were not taking part and hoped that they would follow us to the festival next year! I am so proud to be part of an organization that values people over sexuality/race/religion. It was quite a journey for us to get to Pride this year and we came up against lots of opposition even within our own organization. People are always afraid of what they don’t know. I think they will be happy with what we have to show them! We handed out all our adult registration forms and a whole bunch of girls forms. We even had to phone our provincial office to let them know that TONS of people would be calling for cookie info! By guest blogger and Guider Tara. To read more by Tara, visit her blog The Daisy Field. What action/s have you taken lately to make your Unit more inclusive? Join the discussion! This entry was posted in Girls' Guides and tagged diversity, inclusivity, LGBT. Bookmark the permalink. Good on you for setting up a booth at Pride! I also love that Guiding is inclusive but I find there are many of our own Guiders who aren’t. Showing the public that we do love everyone and don’t have bias is great. Congrats on a job well done! Well done Tara! I enjoyed reading your post a lot. I think that it is wonderful that GGC had a presence at Pride in Vancouver! Thanks for your pioneering efforts and hopefully we’ll see GGC represented at Pride events in other cities in the near future! I am proud of the effort you made. It is always harder if you don’t have the support from within. Great job on doing the right thing! Great post, Tara. Hope that those who you met at Pride are encouraged to join and that they feel accepted and affirmed for who they are. Love is love is love. Oh how wonderful!! Maybe I’ll follow your lead for London Ontario Pride……. I’m glad your public response was overwhelmingly positive! This is so wonderful.You and your friends are our tomorrow. Let’s hope the Scouts can catch up. Maybe they should ask you for help…. Yea!!!!!!! Such a great article! I am the mom of the sweet young man and was thrilled to read this and to hear that you had been at Pride. We have spent many many years Guiding together and it has really made a huge difference in both of our lives. I hope that your presence there is able to provide a difference in many other lives too! Hi there, was just wondering if the Guides will have a presence at the 2012 Vancouver Pride and havent been able to find any info about it! Does anyone know anything about this? from another Canadian Guider….Thank You! !